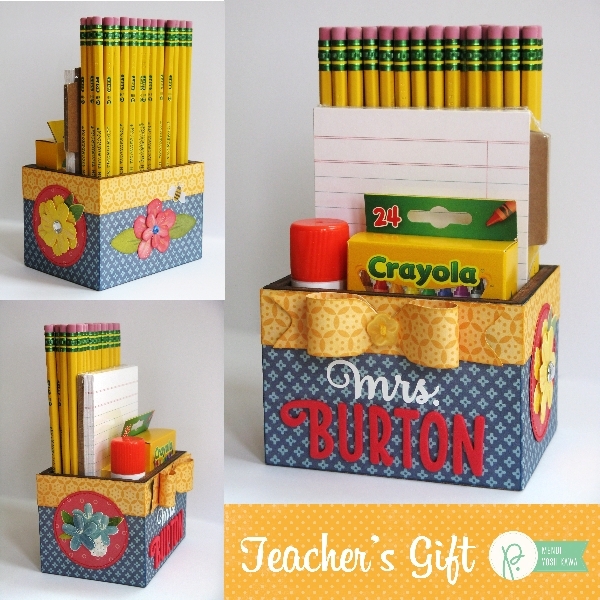 Teacher's Gift Box with Bow Tutorial - Pebbles, Inc.
It’s Mendi here today with a quick and easy gift idea for the special teachers in your child’s life. 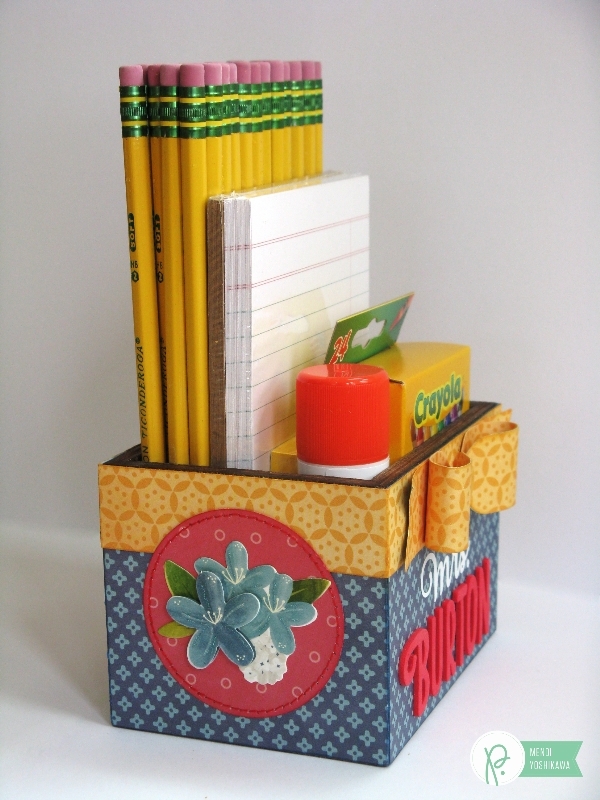 I love creating handmade gifts for my own kid’s teachers and I thought the Wooden Recipe Box from Pebbles Homemade collection was the perfect object to alter for this fun present. 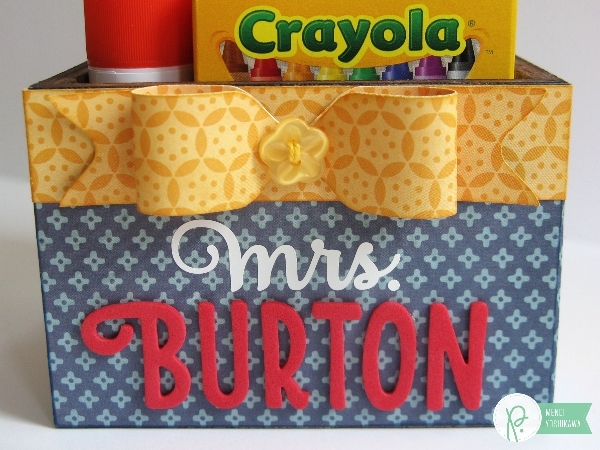 I think personalizing gifts with the Teacher’s name is always a nice touch and it was easy to achieve this using the darling foam thickers from the Homegrown collection. I adore mixing my fonts and THIS cutting file was the perfect way to achieve this. I think it’s pretty cool that it covers all the acronyms you might need. 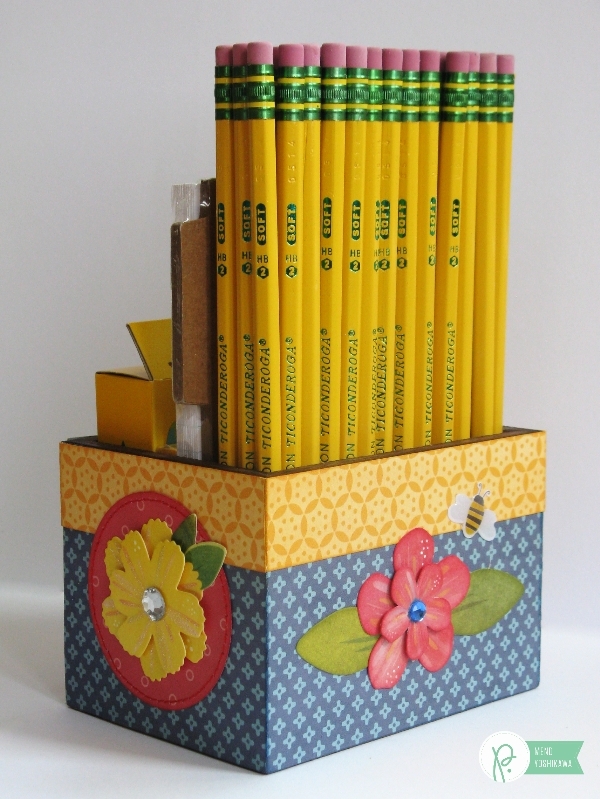 The colors in Pebbles Homegrown collection are a perfect fit for a school themed project. 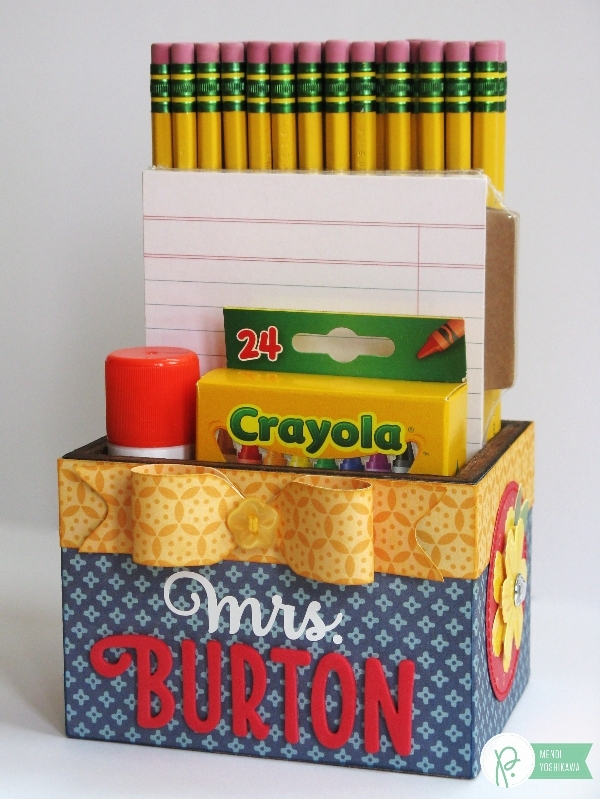 I love how well the colors compliment the school supplies that I added to my box and it’s a wonderful bonus that a basic box like this is able to serve so many different purposes from a recipe box to a phone/address box to a basic container to hold a multitude of different office supplies. To embellish my gift box I created a simple 3-D bow using a tool you might already have in your stash: The Envelope Punch Board by We R Memory Keepers! I have included simple instructions below with a step-by-step picture tutorial. Step 1: Cut (2) 6″ x 1″ strips. Line up the strip at the 3-inch mark on the punch board and punch notches from both sides of each strip. Step 2: Adhere two sides of bow (wrong sides together) with liquid adhesive. This acts as a lining for your bow as well as adding stiffness to maintain it’s shape. (Note: You can also reverse step 1 & 2 punching out the center after the 2 strips are adhered together). Step 3: Line up the center of the bow at the 3-inch mark, punching each side on both ends. Step 4: Gently curl each end toward the center. I used a pencil to gently curl it. Step 5: Adhere the ends in the center with a bit of liquid adhesive or hot glue. I chose to staple the center afterwards for extra stability. Step 6: Cut a 4.25″ x 1″ strip for the ribbon tails. Center the strip in the punch and notch each end as shown. Step 7: Line the strip at the 2-1/8″ mark and notch each side of the ribbon tail in the center. Step 8: Add liquid adhesive or hot glue to center of bow and adhere bow portion to ribbon tail. Step 9: Thread twine through button using an embroidery needle, add a bit of glue to center of button and wrap button & twine around center of bow, knotting on the back. Step 10: Use finished 3-D bow to embellish your favorite DIY or Home Decor project. I hope I’ve inspired you to try this quick and easy gift! The 3-D paper bows are so much fun to make! The bow tutorial was awesome! Thank you for sharing! Very cute project. What kind of machine did you use to make the bow. The bow looks great and would love to make many of them for my cards, Can they be made in larger and smaller sizes. Thanks for your help.